The roots of neighborhood crime prevention, including Neighborhood Watch, can at least be traced back to the Chicago School and its focus on the relationship between the social environment of neighborhood and crime. From the earliest studies on "communities and crime," (Shaw and McKay) to much more recent works (Walker, 1993), research has shown that there is a link between areas with high crime rates and neighborhoods characterized by a heterogeneity of economics and ethnicity, high levels of population turnover and transience, and other physical and economic conditions. Most of this line of research has concluded that crime is higher in "socially disorganized areas" marked by weakened informal control due to an erosion of shared norms. Since formal control organizations (specifically law enforcement) cannot be in all areas at one time, informal control of residents is necessary if that community is to experience low crime rates. When neighborhoods become disorganized, the people and institutions that once assisted in maintaining standards of behavior no longer hold such status, resulting in a breakdown in informal control. This, in turn, produces high crime rates. Neighborhood Watch is one of the oldest and best-known crime prevention concepts in North America. In the late 1960s, an increase in crime heightened the need for a crime prevention initiative focused on residential areas and involving local citizens. The National Sheriffs’ Association (NSA) responded, creating the National Neighborhood Watch Program in 1972 to assist citizens and law enforcement. In the aftermath of September 11, 2001 terrorist attacks, strengthening and securing communities has become more critical than ever. Neighborhood Watch programs have responded to the challenge, expanding beyond their traditional crime prevention role to help neighborhoods focus on disaster preparedness, emergency response and terrorism awareness. In 2002, the NSA-in partnership with USA Freedom Corps, Citizen Corps and the U.S. Department of Justice-launched USAonWatch, the face of the revitalized Neighborhood Watch initiative, which represents the expanded role of watch programs throughout the United States. 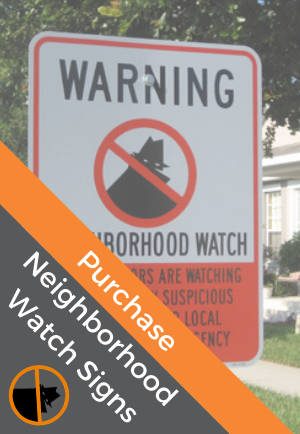 National Neighborhood Watch empowers citizens to become active in homeland security efforts through participation in Neighborhood Watch groups. Many neighborhoods already have established watch groups that are vibrant, effective, and can take on this expanded role with ease. For neighborhoods without thriving groups, the renewed emphasis on emergency preparedness and response may provide the right incentive for citizens to participate in Neighborhood Watch in their community. The foundation of the Neighborhood Watch program is the information, training, technical support and resources provided to local law enforcement agencies and citizens. The training program is designed to build the capacity of law enforcement officers assigned to work with community groups by providing specific instruction on topics important to Neighborhood Watch. In addition to training, Neighborhood Watch has developed a new Toolkit that contains such items as posters, flip books on target hardening for the home, and presentations for the community. To learn more, browse the site. Check out the Resource Center or register your Neighborhood Watch group-it only takes a minute.